Bryce has wanted an IPA for a long time and we have tried on multiple occasions. On these other occasions we have failed and created pale ales that were not of the India stature. This last time we tried, though, we knocked it out of the park. Well, not really. It’s really bitter though. Leo and I went to the brew store at some point before April 6 (when we brewed it) and he picked out the ingredients, including many hops. We had an uneventful brew day — nothing in particular went wrong. We had even more hops lined up, sitting in a container in my refrigerator, but did not use them this time around. I’m not sure exactly what the hops are anymore: they were the hop pellets of brews past that kept on spilling out, the tops of their baggies cut away along with their identities. I’ve no doubt they’ll begin to haunt me and my dreams. 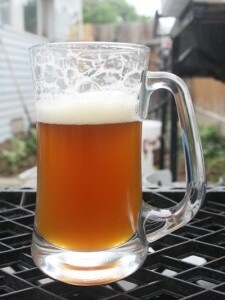 We used the London ESB ale yeast, which seemed to be very tolerant. One can see where the foam was at the top of the mug before settling down into a manageable head. We let it sit, with much hop sediment, for over a month (closer to two months) before we kegged it. We first secondaried it and then finally kegged it. The beer is still cloudy, unlike the ciders which always seem to clear irregardless. As it has aged in the keg, it has begun to foam more and more than it did when it was first put in, becoming harder to pour and the head is retained for one to five minutes before settling down. On its head, there is a large amount of bitterness and underneath is a strong pale ale pedigree. The aroma is there, although it could be more, as could the hops taste itself. But, it is damn bitter. If you like bitter. One of the problems I have found as a homebrewer is once one (Bryce) walked down the path of IPAs, his pallet seemed to be perpetually cleansed of the ability to taste any beer that was not heavily hopped. Alas, alas.